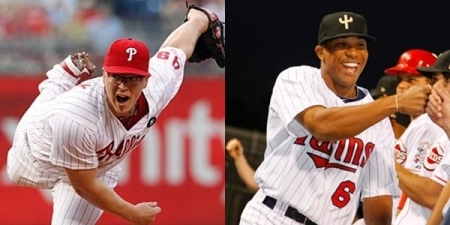 The Philadelphia Phillies have traded right-hand pitcher Vance Worley and top pitching prospect Trevor May to the Minnesota Twins for Outfielder Ben Revere. Fan favorite Worley, 25, has been up at the major league level for 2 seasons+ now with a career ERA of 3.50. In 2011 he was great posting a 11-3 record and 3.01 ERA. 2012 he was less than spectacular with a 6-9 record and ERA of 4.20. Trevor May had an ERA of 4.87 at Double-A this year, was named Phillies Minor League Pitcher of the Year in 2011, and currently rated the number two prospect in the farm system. The Phillies are getting a 3 year veteran in Ben Revere, 24, who although played right field last year, has spent most of his career playing center field. In 2012 he hit .294/.333/.342 with 13 doubles, six triples, 32 RBIs, 70 runs and 40 stolen bases in 124 games played.